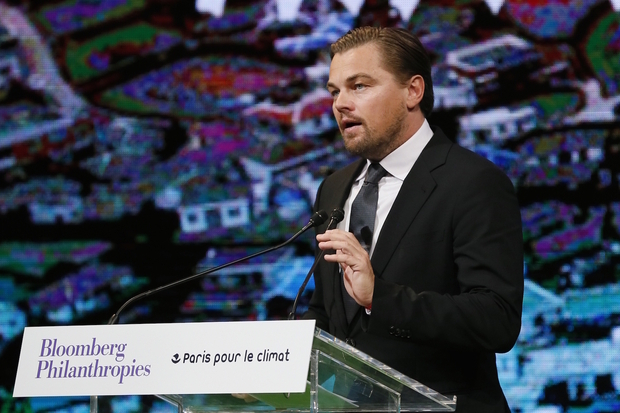 Actor Leonardo DiCaprio delivers a speech during the World Climate Change Conference in Paris on December 4, 2015. The Oscars are a big deal among Chinese movie fans. So it was an especially big deal last month when Leonardo DiCaprio, whose fame in China is as big as the name of the film which held the box office crown there from 1997-2009—Titanic—became what locals call “The King of Film” by winning the Best Actor award for his role in The Revenant. It was also a big deal to his current-day Chinese fans when DiCaprio, who they nickname Little Lee, used his Oscar acceptance speech to call attention to climate change and environmental protection (starting at 02:00 in the video below). Little Lee’s legion Chinese fans flooded social media with rave reviews of his dedication to safeguarding the environment and fighting to stem climate change. Among the most popular shared posts include the Chinese translation of a speech to the World Economic Forum about the threat of climate change (video below), and his numerous tweets or Facebook posts about saving the environment or endangered species. Currently, DiCaprio is working on a documentary on climate change that took him to China, where he met with leading environmental activist Ma Jun. He also was spotted in this video of a spectacular projection on the United Nations buildings in September 2014, a one-of-a-kind promotion for the recently Oscar-nominated documentary Racing Extinction. Since his first meeting with former U.S. Vice President and environmental activist Al Gore, DiCaprio has devoted a lot of his time to thinking about and working on environmental issues. The Leonardo DiCaprio Foundation, established in 1998, has channelled millions of dollars to a variety of environmental causes and scientific research projects. Over the years, he has worked on several films and documentaries with strong environmental themes, such as Blood Diamond (2006, actor), Virunga (2014, producer), and Cowspiracy (2015, producer). A WeChat post listed 20 environmental films and documentaries that have won or been nominated for Oscars over the past few decades. Among them is Chinese American director Ruby Yang’s film, The Warriors of Qiugang, nominated for the Academy Award for Best Documentary Short Subject (trailer below). You can see the whole movie at Yale Environment 360. After her nomination, Yang worked with China’s Ministry of Health on public service announcements. The Oscars’ popularity in China means that films that are nominated and win often grab the attention of Chinese moviegoers, even if the films are not distributed in China. Since 1953, 36 films with an environmental focus have been nominated for Best Documentary Feature, and 12 have won. One recent winner, the 2009 film An Inconvenient Truth, starring former U.S. Vice President Al Gore, is thought to have had a strong influence in style, approach, and substance on the Chinese environmental documentary “Under the Dome,” which went viral on the Internet in March 2015. David O’Connor contributed research and writing.